Cary Grant, Katherine Hepburn and Jimmy Stewart star in the classic, multiple Academy Award-winning romantic comedy--The Philadelphia Story. This event includes exclusive insight from TCM host Ben Mankiewicz. The Academy Award winning story of Philadelphia socialite Tracy Lord (Katharine Hepburn) and the men in her life: First husband C.K. 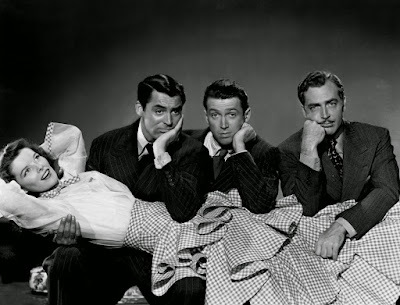 Dexter Haven (Cary Grant), fiancé and self-made business man George Kittredge, (John Howard), and Spy magazine photographer reporter Macaulay “Mike” Connor (James Stewart). We’ll meet on the top floor by the concessions; I’ll be holding a meetup sign.